Sunday's Silly Sign, today, was provided by Maurice Dudley. He is another photographer, living on the island of Okinawa, who has a sharp eye for picking up the unusual and entertaining. To tell the truth, I'm at the point in my life where I don't bother reading signs much, anymore. So, it's a good thing Maurice and a few others keep me informed when they spot one, or I'd be running out of silly sign photos to post here. For sure, if I ever decided to take a splash in the water at this spot and didn't read the Swimming Rules, I'd get hauled away. 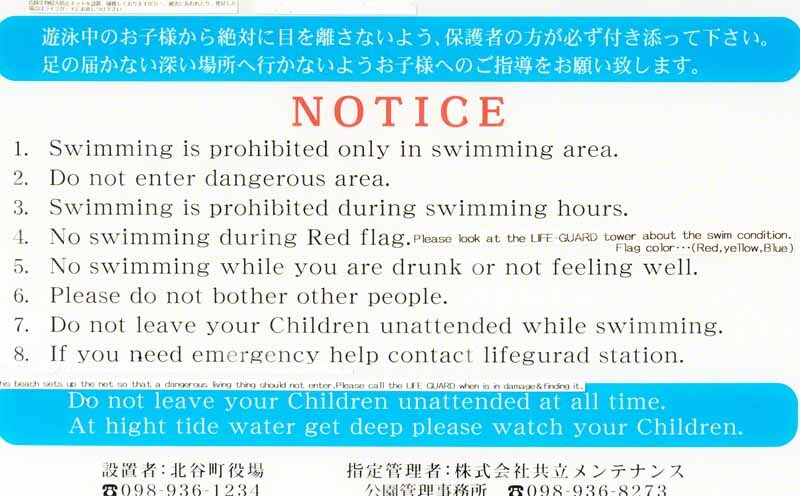 Swimming is prohibited only in the swimming area. It is also, prohibited during swimming hours. Dang. What are you supposed to do, roll around in the sand ? There wouldn't be much sense putting a swim suit on just for that. Maurice has a few sites with his photography on display, I promised to give my readers. Lately, I've been so busy, I forgot to ask where this sign was posted. So, as soon as I get caught up around here, I think I'll get ahold of Maurice and find out the exact location of this silly sign. When I find out which side of Okinawa, Japan that beach is on, I'll head over to the other coast and see if I can find a beach with no swimming rules at all. Thanks and Subagoju thanks you. Hey! Whenever you find a great silly sign, snap a photo and email it to me. It'd be a great way to ahem, ahum expose yourself, legally, I think.